Several reports from usually reliable Windows watchers say Microsoft is poised to unveil Windows 9 at the end of September. The new OS will mark the return of the Start menu, the ability to run Metro apps inside desktop windows, and other PC-friendly tweaks. 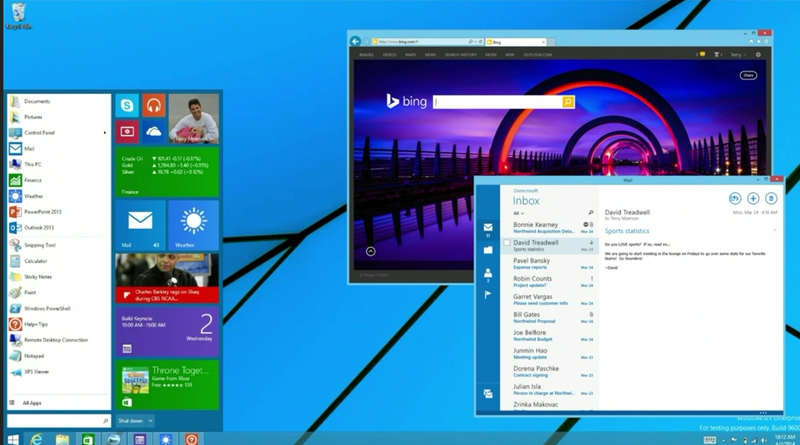 The timing makes ton of sense, in spite of Windows 8's short run. Why? Because Windows 7. Whether you love or hate Windows 8, you can't argue that Microsoft's Live Tile-infused operating system has been… divisive, to say the least. The changes Microsoft instituted to transform its desktop operating system into something more mobile focused were downright shocking to long-time Windows users. While subsequent updates made Windows 8 play far nicer with traditional PCs, the damage was done. Witness the comments on any article talking about Windows 8, which quickly devolve into folks saying that you'll pry Windows 7 from their cold, dead hands. And it's more than just talk: Windows 7's market share continues to climb regardless of Windows 8's release, according to NetApplications. Now Microsoft will continue to provide security updates for Windows 7 until 2020. You just won't be able to buy new Windows 7 PCs anymore, unless you're willing to plop down big bucks for a pricey business machine running Windows 7 Professional. The end-of-sales date for PCs running the consumer-focused versions of Windows 7 is October 31. And while you can still find boxed copies of Windows 7 at some online retailers, official software sales of the OS ended last October. You see the problem: The Windows 8 name alone turns off many enthusiasts. After October 31, you won't be able to buy a new PC without Windows 8, and there will be no hope on the horizon for desktop diehards with a grudge against the OS unless Microsoft announces a more PC-friendly Windows 9 first. Likewise, many businesses refuse to upgrade to Windows 8, given the high training costs required to teach everyday workers to navigate the overhauled operating system. It's in Microsoft's best interest to introduce a version of Windows that's more oriented towards change-averse enterprise sensibilities sooner rather than later, so that companies can begin planning their eventual migration away from Windows 7. Those migrations can take a long time. Most leaks say Windows 9—or whatever the build currently dubbed "Windows Threshold" will eventually be called—won't appear until spring 2015. It'll be Windows 8 or nada (or Mac, or Linux, or Chrome OS) from the end of October until then, even if the leaked Windows 9 timelines hold true. But if Microsoft indeed reveals Windows 9 and its reborn Start menu in September, at least there will be light at the end of the tunnel. Past reports indicate that Microsoft is taking steps in the right direction with Windows 9, and yes, we have some ideas on what we'd like to see included in Windows 9 to make it shine even more brightly. But why wait if you truly dislike Windows 8? While most big box retailers gave up on Windows 7 machines long ago, there are still ways to buy a new Windows 7 PC in the Windows 8 era—if you act quickly.